Explore the the use of this term “Model Minority” to describe Asian American communities. A minority group whose members are perceived to achieve a higher degree of socioeconomic success than the population average. Explore the the use of this term “Model Minority” to describe Asian American communities from three unique and differing points of view. Advocate Christopher Punongbayan’s explains how racial prejudices unfold. What do you hear when someone uses the term "model minority?" How do achievements and challenges of Asian-American and Pacific Islander-American individuals get lost in racial stereotypes? Use the hashtag #WhatIHearPBS to share your thoughts. Dig deeper into the conversation with a detailed Viewing Guide: What I Hear When You Say: Model Minority. 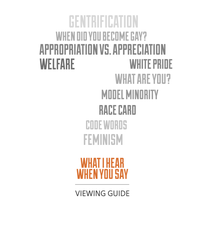 Choose from over 10 topics to explore common code words & phrases used in conversations about race & identity.